Every week this December, we’ll be hearing the tale of a first Christmas. Here food writer and broadcaster Caroline Hennessy (aka BiblioCook) recalls the first time she was entrusted to cook the turkey… and the electricity went. WE WOULD HAVE always had Christmas dinner at my grandparents’ house with numerous cousins, aunts, uncles, grand aunts. It was a huge gang of people and it was all hands on deck. Everyone making mince pies and doing the bread sauce and all the rest of it. Christmas Eve was spent at my grandparents’ house. Head down, everybody working. Whoever wasn’t in the kitchen was doing the cleaning. You could put dusters on small kids and tell them to go around the bookcase! There was no sitting around. If you keep people busy, they don’t argue. Eventually we moved to my parents’ house for Christmas and we’d take different roles. Everyone was allocated a different job and this one particular year the turkey was my job. I had every confidence in my ability to do that without having any problems… except the electricity went off on Christmas Eve. We were sitting there and there was only a limited amount of the actual prep we could do – you couldn’t bake your mince tarts and all the rest of it. We had all those ready to go and we thought, ‘Sure, it’ll come back on any minute now.’ No sign of it at all. Back in the nineties, you didn’t have Twitter and you didn’t know what was going to happen. So at five in the morning, myself and my Dad got up, put the turkey in the car and drove it over to my grandmother’s. We wrapped it all up, tucked it into the car and myself and Dad drove off home thinking they’d still be in the grim ages without electricity only to discover that the electricity had come back on about five minutes after we’d left. As soon as the electricity came back on, my siblings and mother swung into service because that was their area. The turkey was supposed to my special baby. We got home and I think we managed to eat at around 4pm – normally we would have eaten around 2pm. It’s lovely to revisit it in my head. I just remember sitting around the fire that Christmas night and obviously there was nothing on television because there was no television. We had the candles lit, the fire was lighting, the house was warm and cosy and it was so peaceful because we just couldn’t do anything. It ended up being a very special Christmas and myself and Dad still laugh about driving around the countryside with a turkey in the backseat. Want to win a €100 Aldi voucher to help you celebrate in style? Enter this week’s Aldi Christmas Magazine competition right here. Email “'We were driving around with a turkey in the back seat': The year a storm nearly ruined Christmas dinner ”. 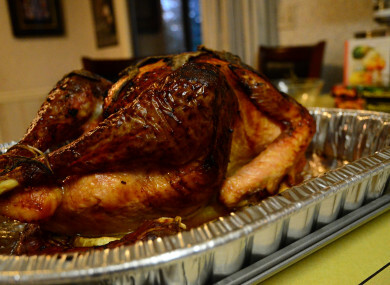 Feedback on “'We were driving around with a turkey in the back seat': The year a storm nearly ruined Christmas dinner ”.